We "got" a new roof yesterday. We hired an amazing group of roofers who were timely, professional, precise, and efficient and got a great deal for excellent service. 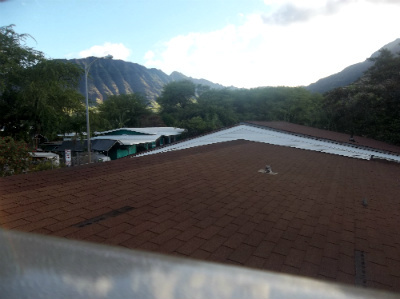 Here's a shot of the new roof from the nursery window, the best seat in the house for watching the roofing job. While the crew was working, I was able to take two quick snap shots through the nursery windows. Pardon the screen and jalousies. :) First, the asphalt saturated felt was stapled down. The stapling sound nearly sounded like a semi-automatic. One of the workers was amazingly fast; I'd blink and he'd be nearly done with the row. I came back an hour later and saw that they already were nailing in the shingles. 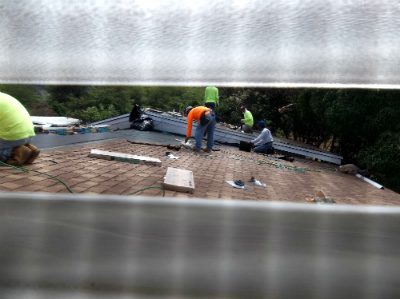 We have a larger than average roof, so 3-4 men manned each of the three sections of roof of our upstairs and downstairs home. 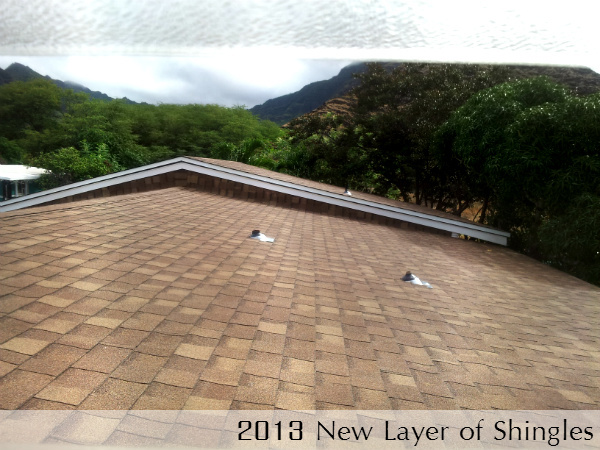 This old 1978 roofing job is now covered by a water tight, more light reflective roof. My mom wants to climb out the window to lie on the roof to get a clear view of the night sky. :) Sounds like a plan. I'm currently in need of a new roof, so I've been researching the common materials used as well as methods. I think I like the idea of a metal roof because of it's durability, but I'm not sure I would be able to handle the noise. Do you know of any materials that are almost as durable but less noisy? I've also been looking into the best Moore Oklahoma roofing contractor in my area to the best work for me. 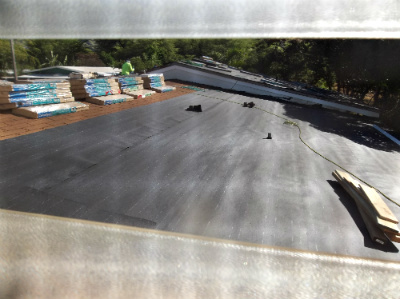 This is one thing you can expect when hiring proficient and hardworking roofing specialists. They are dedicated to delivering a fantastic result. You have a one big roof, by the way. I think your mom's idea would be great. Try climbing up onto your roof and do some stargazing! I absolutely agree. Thank you for your quality comment. Quality service is what you'll get by choosing to work with reputable roofing contractors! They work fast too, right? I like your mom's idea, by the way. Just be careful when you climb up on your roof.